Should you buy Lidl’s £80 Professional Stand Mixer? Lidl is selling a cheap stand mixer with blender attachment while stocks last. But how does it measure up to the popular brands? If you’re looking to upgrade your baking equipment in time for Christmas, or just trying to get ahead on your shopping, Lidl’s shiny red Professional Stand Mixer might catch your eye. 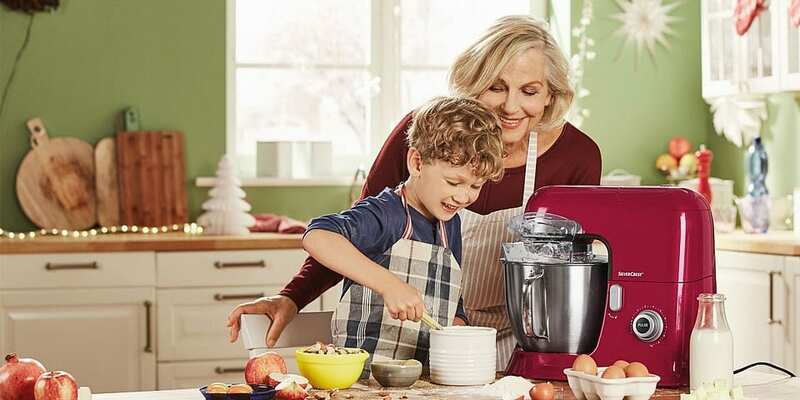 At just £80 it’s far less than you’d expect to pay for the big brands such as Kenwood or KitchenAid, and you get a blender attachment for making smoothies and soups thrown in too. It’s available in stores from today, Thursday 15 November, while stocks last. Lidl’s cheap kitchen appliances usually sell out fast, so you’ll need to get there sharpish if you want to grab a bargain. Read on to find out what you can expect for the price and how it compares to rivals on spec. To see which cheap stand mixers impressed in our tough baking tests, read our independent stand mixer reviews. Lidl Silvercrest Professional Stand Mixer: is it a good deal? Following the launch of their basic £40 stand mixer in September, Lidl’s Professional mixer is twice the price but with a few tempting upgrades. Available in black or red, you’ll get a bigger capacity and more power with the new model. The 6.3-litre mixing bowl is more generous than most stand mixers – ideal for bigger households or those ambitious three-tiered showstoppers inspired by this year’s Bake Off. It has 10 speed settings and a separate pulse function for more controlled bursts of mixing. There’s also a bonus glass blending jug attachment, so it could save you money on paying out for a separate blender. At 1.5 litres, it’s a decent size, so you’ll be able to make bigger batches of soups to stock up for those cold winter nights ahead. The standard mixing attachments are included: a whisk, dough hook and flat beater. There’s also a splashguard to stop ingredients spraying out of the bowl while mixing. It even has a handy lid to allow you to add ingredients as you go. Teflon non-stick coating should make the attachments easy to clean, and the bowl and blending jug can go straight in the dishwasher. 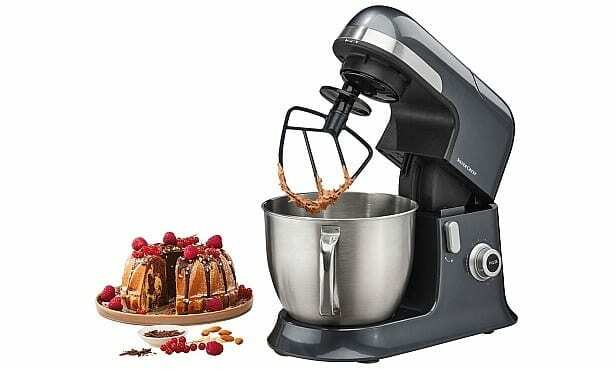 Like most Lidl special offer gadgets, this mixer comes with a three-year warranty. On the face of it this Lidl mixer gives you a lot for your money. If you’re on a budget but looking to make bigger batches, it could be just the ticket. However, without having put it through our independent tests, we can’t say how good it’ll actually be when it comes to kneading, mixing and whisking. For tried and tested options, see our pick of the best stand mixers. Lidl vs Aldi stand mixer deals – which is right for you? Aldi currently has a £100 premium stand mixer as an online exclusive on its website. This has a more distinctive retro look reminiscent of KitchenAid, but a smaller capacity and fewer speeds (eight instead of 10). It doesn’t have a jug blender but does come with a handy splashguard and the main beater accessory has a flexible silicone edge, which can be good for scraping stray ingredients from the side of the mixing bowl. Overall, which one you prefer will come down to how much you want the extra capacity and blending abilities, and how much you want the KitchenAid look. Is it worth spending more on a stand mixer? Spending less doesn’t necessarily mean you’ll get worse results. We’ve tested several mixers for less £100 that whizzed through our tough kitchen tasks and just missed out on being Best Buys. However, not all cheap mixers are made equal, so be sure to check our stand mixer reviews to uncover the best options. Find out what you need to look for in our guide to buying the best stand mixer. Got your heart set on a KitchenAid? 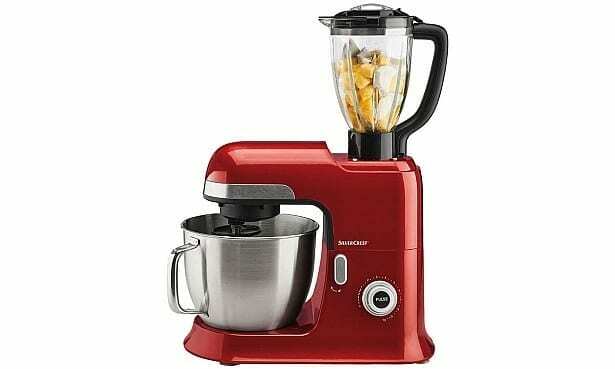 Find out how to get the best deal on a KitchenAid or Kenwood stand mixer.